Ms. Pansy Ho, Co-Chairperson & Executive Director of MGM China Holdings Limited, poses a group photo with curators and contributing artists of the MGM COTAI Art Collection. 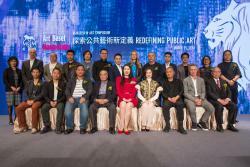 [March 25, 2018, Macau] MGM, a leader in artistry and entertainment as well as a proud sponsor of Art Basel, hosted an art tour and symposium on redefining public art to further its mission of making art more accessible to the public and enhance community awareness on art and culture through MGM COTAI’s spectacular art program. The “Explore Spectacular” journey began with an art tour of the imperial carpets, The Chairman’s Collection and digital art collection of the newly opened MGM COTAI. It was then followed by a Meet-the-Artists session in which the participants had an up-close encounter with the contributing artists of the MGM COTAI Art Collection, including Hsiao Chin, Ung Si Meng, Xue Song, Gao XiaoWu, Lin Guocheng, Su Xing, Hung Yi, Chloe Ho, Hong Wei, Zheng Lu, Guan Yinfu, Yu Yang, Liang Jenhung, Eric Fok, Kum Chi Keung and Wang Kaifang. The journey concluded with an art symposium on redefining public art with welcome remarks delivered by Ms. Pansy Ho, Co-Chairperson & Executive Director of MGM China Holdings Limited. The dedicated tour and symposium attracted over 200 participants including renowned regional artists, representatives from local arts and cultural scene, educators and students from the art discipline. The curators involved in the artistic making of MGM COTAI including Mr. Calvin Hui, Co-Founder and Artistic Director of 3812 Gallery as well as the Curator of The Chairman’s Collection; and Ms. Michelle Grenier, Associate Creative Director of Obscura Digital as well as the Creative Director of Digital Art at the Spectacle, shared their inspirations behind their creation and curation. Mr. Tim Marlow, Artistic Director of the Royal Academy of Arts, moderated their exchange of ideas on the power of art in public places and how MGM redefines public art. As a World Center of Tourism and Leisure situated in the vibrant Greater Bay Area, Macau leverages its rich East-meets-West heritage to evolve as a cultural hub with diversified tourism offerings. MGM has infused parts of Macau’s legacy into both of its properties, MGM MACAU as well as MGM COTAI. The Company has brought magnificently expansive art and cultural programs to Macau, streamlining an organic combination of the past, present and future of Chinese art and culture. The newly opened MGM COTAI features over 300 captivating and thought-provoking works seamlessly integrated with its public spaces. The MGM COTAI Art Collection spans from antique imperial carpets dating from the Qing Dynasty, modern and contemporary Asian paintings and sculptures by renowned artists, freshly-commissioned works by local and regional rising talents, large-scale interactive installations to an exclusive array of digital art collected from around the globe. Connecting East with West and blending tradition with innovation, the MGM COTAI Art Collection is part of MGM’s goal to bring world cultures together through innovative artworks that are each spectacular in their own right, and coalescing that into the diversified entertainment and offerings made available to people from all walks of life.